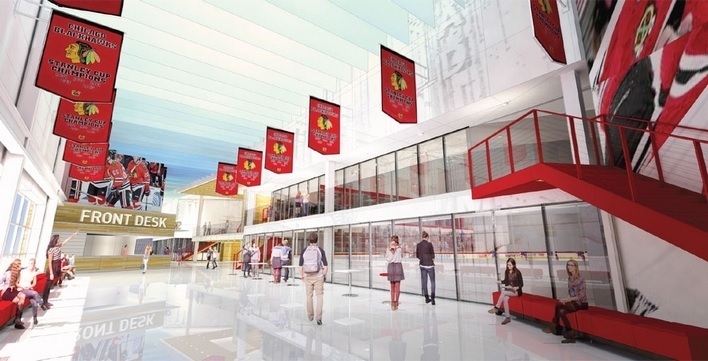 According to a report from Crain’s on Thursday, Rocky Wirtz has plans to give the area surrounding the United Center a significant facelift. Here’s more on the proposed office building. Sounds like the Hawks are taking the Chicago Fire’s lead on the new facility they built recently on the north side not for the pro team, but to build closer ties with all of soccer fans on the north side who play rec soccer. Seems like a very good idea to connect with the community. I would suspect some underground parking structure would be in the mix there so they don’t lose $ on that. Good for the Hawks, they are taking advantage of smart marketing and team success and finding additional streams of revenue. As some one in my mid 30’s who started playing youth hockey to now have children playing youth hockey it is exciting to see the growth of the game. 25 years ago hockey was very much a niche game. I can’t speak to other communities but my sons/league team has over 100 children under 7 playing playing youth hockey and that’s a great thing to see for fans of the sport. New rinks and hockey facilities are a good thing for the game. The Blackhawks have done an excellent job to grow the game locally and the organization has done an even better job drafting and promoting the team. With the on ice success of the team none of this would have been possible. 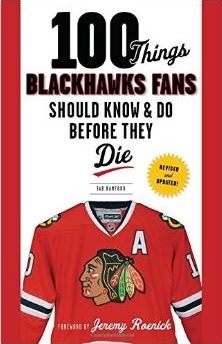 Kudos to the Hawks! I hope they include hotel and restaurant complex where you could stay when in town for a game. It would be nice not to have to make the 4.5 hour drive home after the game and just stay around and party. Parking garage. That’s what I was thinking with 3 parking lots now to a practice facility, an office building and another practice facility. Why not put up a hotel with several restaurants and some bars. That’s a good idea. Theres lots of room to expand, by being able to parking garage it. @EspoForever – where are they putting the hotel? On top of the only remaining parking left within a half mile of the UC? I find it interesting that no one is talking about the neighborhood of West Haven just north of the UC. How about someone fills in the empty plots with some market rate housing and rebuild the park at Wolcott and Washington where kids have football practice in the summer. Seems like that neighborhood still needs to be completed. Uhh… guys… there are like a thousand hotels in Chicago. Not sure why they need to build one on top of the UC when you could take a 5 mintue cab ride. Oh, also, remember. The Hawks are “losing money”. @TabBamford – where are they putting the hotel? On top of the only remaining parking left within a half mile of the UC? Explain to me where this one remaining parking lot is within a half mile of the UC? Because even by developing all of the lots to the immediate East of the UC, there are still at least 9 lots surrounding the arena used for parking. There are over 100,000 hotels rooms within the city of Chicago, the vast majority of which are in exponentially more exciting neighborhoods… none of those work for you?